Workbench Magazine is now My Home My Style! Come visit our new website. 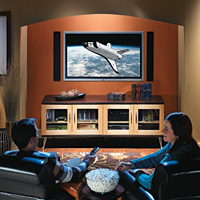 The entertainment center tends to be the focal point in any living room or den. We often arrange our furniture around our entertainment setups for optimal viewing, and even let our home theater components dictate the placement of our decor. Since it serves as the focus of the room, the entertainment center should be a piece of furniture that’s worthy of the attention, even when you’re not watching television. It helps if the cabinet can hide the clutter and tangle of wires that we’ve come to expect with today’s home theater setups. Over the next few pages, we’ll show you how to create a project that certainly meets that need — and more. You can download the detailed builder’s drawings with our dimensions at the link to the left.